If you are looking for a dog as a forever companion, what better time than January to welcome one into your home? Rather than purchase from a breeder, think of all the thousands of rescue dogs that are eagerly awaiting adoption in the numerous shelters around the country! The New Year is the perfect time to welcome an abandoned dog that has probably suffered through no fault of its own, into your home and family. Unless they are adopted, millions of dogs (and cats) will spend another year alone, deprived of the love and affection they deserve. 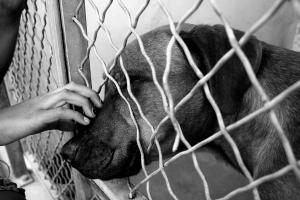 Every year, it is estimated that 5-7 million dogs and cats find themselves in rescue centres around the world. Of this figure, some 4 million are destroyed either because they are not adopted or because their centre has become too overcrowded to continue to house them. The majority of dogs initially enter shelters because their owners can no longer care for them (often because of financial difficulty or changing circumstances) or they have escaped from their homes and are picked up as strays roaming the streets. I say initially because many of these dogs will find themselves returned to a shelter, with roughly 20% of people dropping dogs off at rescue centres, having acquired them from one in the first place. Rather than invest a large sum of money into purchasing a puppy from a breeder (who may or may not be responsible) or from a pet shop (something which isn’t advised as their animals are usually acquired from puppy mills), give a donation to an animal shelter instead! Unlike pet shops, rescue shelters screen all dogs that come to them and most UK centres ensure all their dogs are micro-chipped, flea-treated and very often neutered before being placed in a new home. If the dog has a treatable health condition, most rescues will provide the appropriate veterinary care, footing the bill themselves. Rescue dogs are also given personalised care based on their individual needs and prospective owners are provided with all the information they need regarding the personality, activity level, compatibility (with children and other house pets), quirks and general temperament of their dogs so that people can make an informed decision before adopting. Most behavioural problems observed in rescue dogs are a direct result of their being housed in busy and noisy kennels where all the dogs compete for attention while they await their forever homes. These issues usually correct themselves once the dog has become accustomed to its new home and family, but if they don’t correct naturally then attending specialised training classes or seeking the help of a canine behaviourist will usually solve the problem. Dogs that have a history of aggression or are terminally ill are not accepted by rescue centres as they cannot re-home them or fund their care. Therefore, most dogs you find at shelters will be loving, healthy and perfectly trainable creatures given time. With a range of breeds to choose from (mostly cross-breeds and therefore entirely unique!) of different ages, personalities and appearances, what better way to find your perfect companion than at your local shelter? If, however, you are looking for a pedigree, it is not unheard of to come across one at a rescue centre, with 25% of all dogs entering them being purebred. It may take a while longer to find one, but the wait is definitely worth it to adopt a beautiful animal desperately in need of a home. Dogs aren’t the only animals to be abandoned or separated from their owners and in need of loving families this January. Thousands of cats, horses and small animals like rabbits and guinea pigs are destined to wake up alone again and again. As with any animal, considering how you will care for it for the rest of its life is very important, and there is nothing worse for a rescue animal than finding its ‘forever’ home, only to be returned to the shelter because its new owners cannot care for it. If you have thought long and hard about adoption and decided you are ready for the commitment, go forth and find your perfect companion! home with love, warmth, food, walks and words were. She's been here 3 months now, everything is going well, the girls have taught her really...she's 99.9% clean in the house. Loves walks, lead training was a piece of cake, she does suffer a bit with separation anxiety so she hasn't been left much longer than an hour so far and I dont go out much anyway. Its early days and I see no reason not to think that things will improve with time. I cannot imagine life without my girls, we have beautiful country walks here, right outside our front door and there's a certain amount of pride in knowing that Ive done something good. I too adopted a wonderful rescue dog from Romania, from Angels Without Wings, called Skye. She is a Tibetan Spaniel and after five years in London has settled wonderfully. She lives with cats,birds and fish, the first 6-12 months were not the easiest as she was fearful and traumatized, but after love,kindness and care, she is absolute wonderful. I would recommend to anyone ,as it was not easy to adopt from the UK. Everything is made easy and she is now 9 and going strong! I would certainly do it again and it was the best desc ion I made! God bless Skye and the rescue staff!